It's not just about football. 2016 was an extremely important, tragic and poignant year in French society. In a sporting sense, the country welcomed people of all creeds, cultures and nationalities when they hosted Euro 2016. As we sadly know, the sense of love, joy and happiness that we all get from football was tragically overshadowed by the constant fear of terrorist attacks taking place. Much like the recent tragedies that the U.K, Belgium, Germany and countless other countries have endured, France was attacked by extremists and terrorists. While certain right-wing ideology will argue that immigration and cultural-integration is detrimental to the social fabric of a country, there's the counter argument that an open, diverse and tolerant country is a far better approach. In a strictly sporting sense, this was true of the French side that won the World Cup in '98 because the majority of the French team could claim heritage from countries like Guadeloupe, Algeria, Argentina, Senegal, Poland, Portugal, Ghana and more. In a way that's different to any other country, the footballing identity of the French national side is shaped by its culture, history and politics. In the documentary Les Bleus - Une autre histoire de France, 1996-2016, the filmmakers chart 20 turbulent years of the French national side and it's an absolutely riveting watch. Viewers get to see a first-hand look at how they went from World Cup winners in '98 to flops in Japan/Korea. 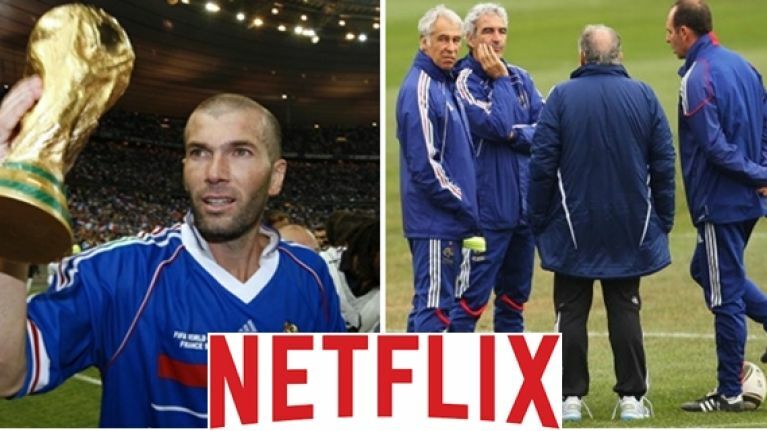 We're also treated to the Zidane's rise and fall during World Cup '06, the fallout from Thierry Henry's infamous handball, the public backlash to the team, the strike against Raymond Domenech's coaching methods in South Africa and the subsequent resurgence of Les Blues under Laurent Blanc and Didier Deschamps. If you think that the documentary is 100% focused on football though, you're wrong. Issues like class, race and nationality are all prominent. Anyone that has already seen Les Bleus - Une autre histoire de France, 1996-2016 has been extremely impressed. Just finished watching Les Bleus: Une Autre Histoire de France, 1996-2016. Such a powerful film about football, nationality, race, & class. "Les Blues" on Netflix vexed me. The French national team is a mess. Note, the below footage is in French but the documentary that's currently available on Netflix has subtitles. Trust us, it's a great watch.